Home Article Polish Actress Erika Kaar is enjoying a Romantic Relationship With her Boyfriend; Are They Getting Married Anytime Soon? Polish Actress Erika Kaar is enjoying a Romantic Relationship With her Boyfriend; Are They Getting Married Anytime Soon? Erika Kaar is a West Berlin-born actress who made debut in the acting field from BBC miniseries in the lead role as Joanna in 2014 film "The Passing Bells". Later, she also appeared in 2014 television series Blondynka in episode one playing the role of "Barber". Fans are questioning, who's she dating behind the screen. Is she dating a boyfriend or secretly married? Let's find out more about Erika Kaar including her net worth! Polish Actress Erika Kaar Dating Her Boyfriend Maciej Bielsk: Are They Getting Married Soon? The Polish actress Erika Kaar is currently dating her longtime boyfriend Maciej Bielsk. She's yet left to get hitched. 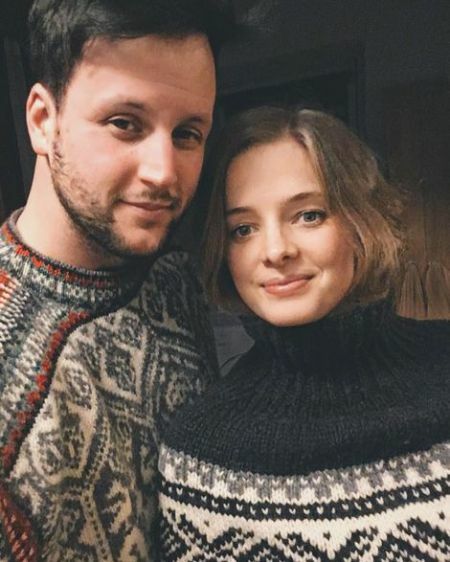 Polish actress Erika Kaar with her boyfriend. Surprisingly, Maciej is also an actor who performed in many small roles from his hometown in Poland. Together, the happy couple shares a beautiful relationship out there flaunting their romance often to their fans through their social sites. Not only that, Maciej made his step in a small role with his girlfriend Erika in 2016 blockbuster Bollywood movie Shivaay alongside Bollywood legend Ajay Devgan. The pair have kept their information about how long they are together and how they two met under the radar. As of now, the duo has not announced any news of their marriage. Looking closely towards their relationship, we can say the duo will walk down aisle very soon. Shivaay actress Erika Kaar not only garnered millions of hearts in Bollywood but also a whopping net worth in 2016. As of 2019, Erika Kaar's estimated net worth is around $400 thousand. Approximately, Kaar earns around $39 per hour which figuratively extends up to $52 thousand per year from her big screen appearance and $15 thousand to $25 thousand as a television actress. The West Berlin native star was also seen in the leading role of Natalia Domirska in 2015 TV series Az po sufit!. Also, her movie, Shivay generated around $20 million against the budget of $14 million. In 2017, she made an appearance in film Bodo portraying the role of Hania. Erika Kaar was born on 3 October 1988, in West Berlin. The 30 years old actress stands with a fair height of 5ft 6inches weighing 52kg. Shivaay blonde looks perfect with her blue eyes and body measurement of 32-25-33 inches. Kaar is of Polish nationality, who has a West Slavic Ethnicity. She has earned a Master Degree in Economy from Warsaw School of Economy, Warsaw.